Happy Monday, or, I mean, Wednesday! It just feels like Monday since we’re in post-holiday mode. I hope you all had a wonderful 4th of July! I had a blast, spending time with family at the beach (post to come!). I have some exciting news! 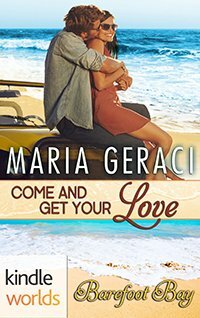 Amazon has selected one of my Barefoot Bay novellas, COME AND GET YOUR LOVE as part of a special promotion. It’s on sale for one week only. You can get it for just 99 cents today through July 11, when it goes back up to its regularly scheduled price again. I LOVED writing this story about a slightly spoiled baseball player finding love and I hope you do too! You can get your copy right here. Brian “Boom-Boom” Callahan might have a million dollar swing, but his bad boy rep has gotten him in trouble with his major league baseball team, so he’s been temporarily sent down to the minors to teach him a lesson. Aubrey Adams’ fledgling PR firm has been hired to keep the Barefoot Bay Bucks’ new hotshot hitter under the radar. All he has to do is play nice for the rest of the season and she’ll get a much needed bonus to keep her company afloat. Being sent down to the minors is Brian’s worst nightmare, but one look at Aubrey and he decides that the next four weeks might not be so bad if he can get the cute brunette to warm his personal bench. Aubrey’s not about to be anyone’s groupie, especially not to a spoiled athlete whose batting record is only surpassed by the number of women he’s reported to have bedded. But when Brian lays on the charm, Aubrey finds herself falling for the funny, kind, and intelligent man he hides from the press. When a well-intentioned gesture gets unexpected national publicity, Aubrey has to wonder if she’s up to playing in the big leagues, or if she’s just being played.